There are three parameters that control how bright an image will be, as shown graphically in image above. This is what is known as the exposure triangle, because all three of these parameters are related: adjust one of them, and the other two must be adjusted to compensate or the image brightness will change. The two parameters at the bottom control how much light reaches the sensor, while the ISO controls how sensitive the sensor is to light. It must be kept in mind, however, that when one of these parameters gets adjusted, the image will take on different qualities. 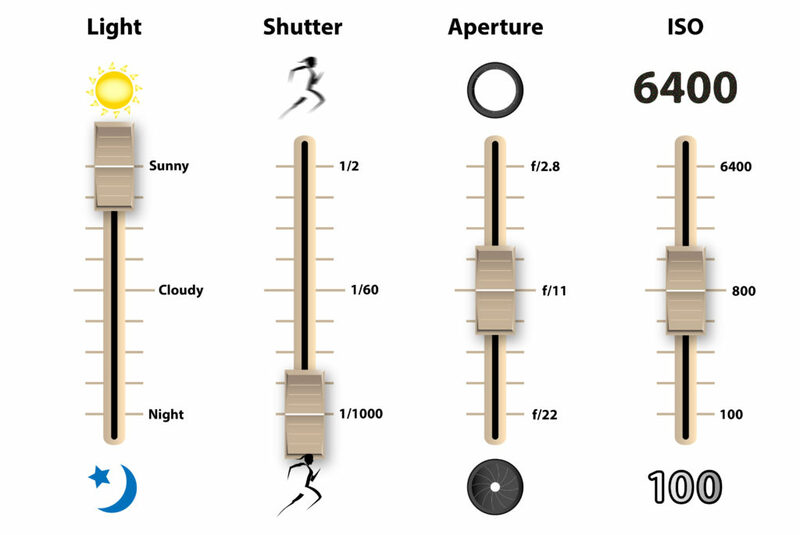 For example, increasing the shutter speed reduces the amount of motion blur, increasing the aperture reduces the depth-of-field (distance from near to far that is in focus), and increasing the ISO increases the noise. This is shown graphically in Figure 1, which is a more detailed representation of the exposure triangle than the basic diagram shown above. Let’s take a closer look at how the different image parameters making up the exposure triangle work with respect to each other, and how they affect the image. Figure 2 demonstrates this with a set of sliders for each of the three image parameters, plus a fourth slider to adjust the amount of light. For example, let’s say that we are photographing a fast-moving subject and want to freeze the action by increasing the shutter speed. 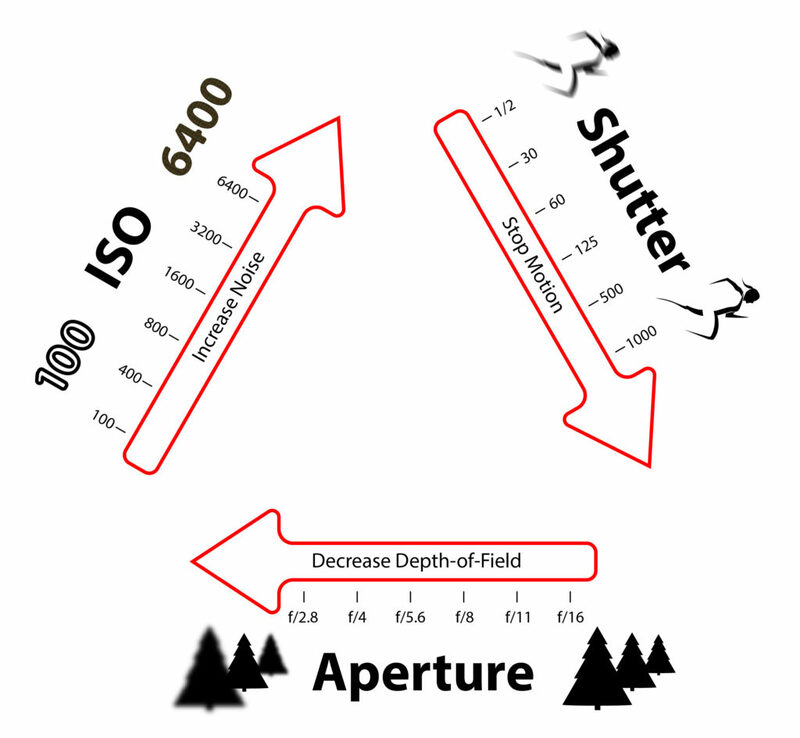 To maintain the same exposure, the aperture could be increased, as shown in Figure 3. However, let’s say that we don’t want to lose our depth-of-field by increasing the aperture. In that case, we could leave the aperture alone and increase the ISO, as shown in Figure 4. 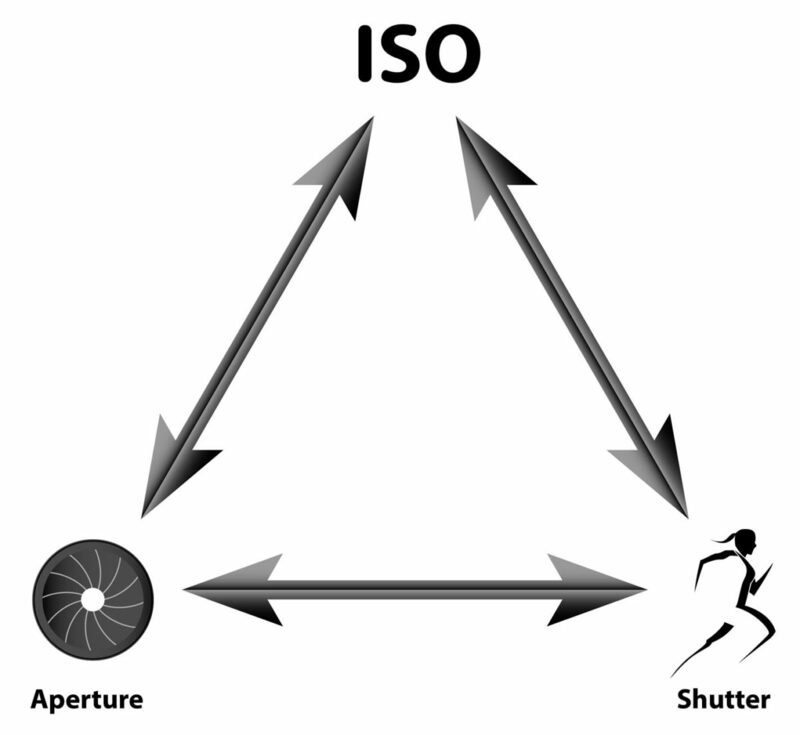 Yet another alternative would be to adjust both the aperture and the ISO, as shown in Figure 5. Now let’s demonstrate what happens when the lights are turned up. Of course, we could adjust any of the other parameters in Figure 6 and come up with the same exposure. It is a good idea to mentally adjust the sliders in the figures above to get a feel for how the different parameters work together. 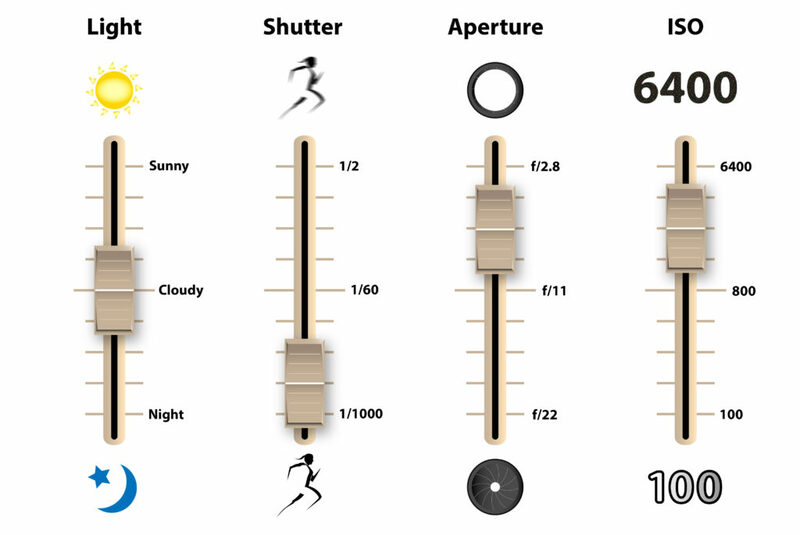 Just remember that if you adjust one slider, other sliders will have to be adjusted to maintain the exposure. Let’s turn our attention to some photographs to show what this looks like in a real-world (albeit very controlled) setting, shown in Figures 7 through 9. On a side note, the sliders to the right of the images in Figures 7 through 11 show the exact settings used to shoot the image. 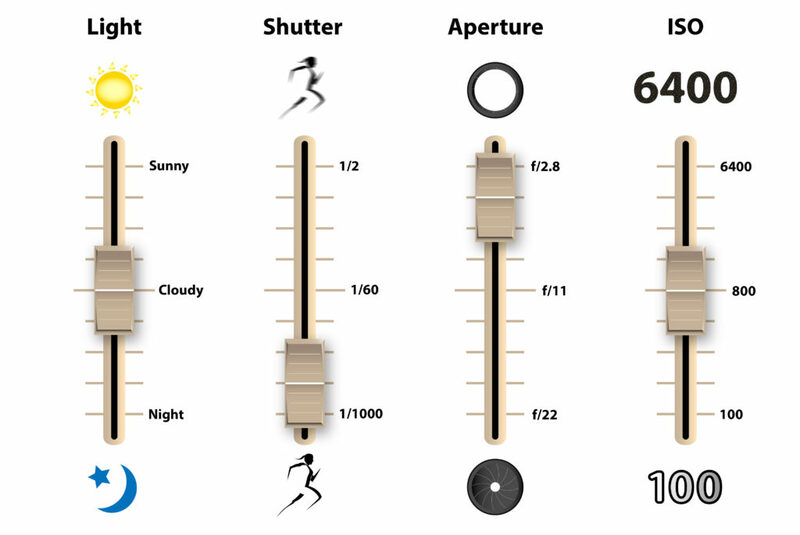 The ISO was held constant in Figures 7 through 9, so the parameters that changed were the shutter and aperture. Notice that while all three images do have the same exposure, they are very different in a few key areas. The rotating fan blades appear to be almost stationary in Figure 7 at 1/500 of a second, while they are a complete blur in Figure 9 at 1/15 of a second. This is the consequence of changing the shutter speed to adjust the exposure. Also notice that the depth-of-field has changed between the three images. To maintain the same exposure while decreasing the shutter speed, the aperture was correspondingly opened. I have written an entire article on the f-stop and aperture if you want more information, but the important thing to keep in mind here is that the larger the aperture, the shallower the depth-of-field. In Figure 7, shot of f/2.8, only the fan is in sharp focus. In Figure 8, shot at f/5.6, the 747’s in the mid-ground are starting to come into focus. And in Figure 9, shot at f/16, the 747’s are in sharp focus. Even Apollo, sitting in the background, is in fairly good focus. Figures 7 through 9 demonstrate how an image can maintain the same exposure while adjusting the shutter and the aperture. I want to stress that understanding this is very important if you want to unleash your creative potential. There are many times in photography where you will want to selectively focus to tell a story or isolate your main subject, while in landscape photography you will likely want to maximize your depth-of-field. If you are shooting a waterfall, you might want to select a longer shutter to give the waterfall a smooth, sort of velvety look. For shooting sports, you will likely want to select a fast shutter speed to freeze the action. Remember that the camera has no way of knowing what effect you desire. If you simply put the camera in automatic mode, it will meter the scene and choose it’s own parameters, which may or may not be ideal for the situation. I want to discuss a different situation this time: what happens when you change the ISO? 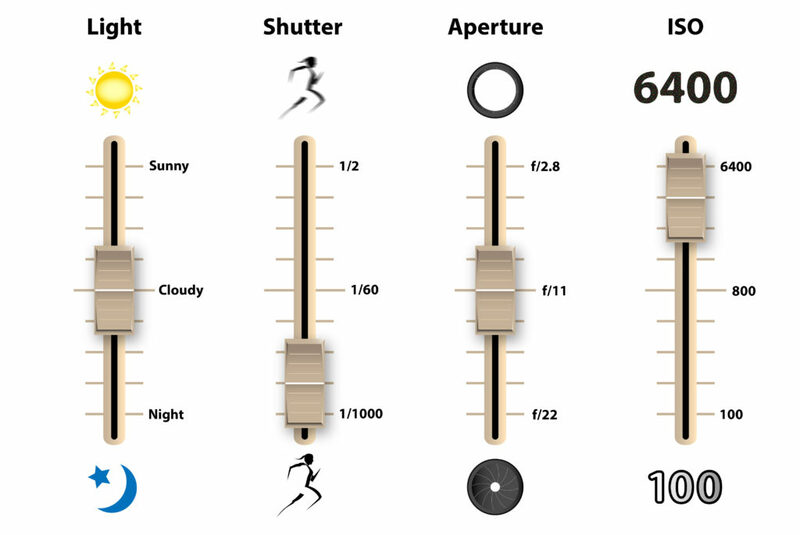 The ISO is a measure of how sensitive the sensor is to light. Double the ISO, and you will double the exposure. Using a high ISO can be necessary in certain situations, such as when hand-holding your camera either in a dark room or outside at dusk. Figures 10 and 11 show what happens when the ISO is increased. 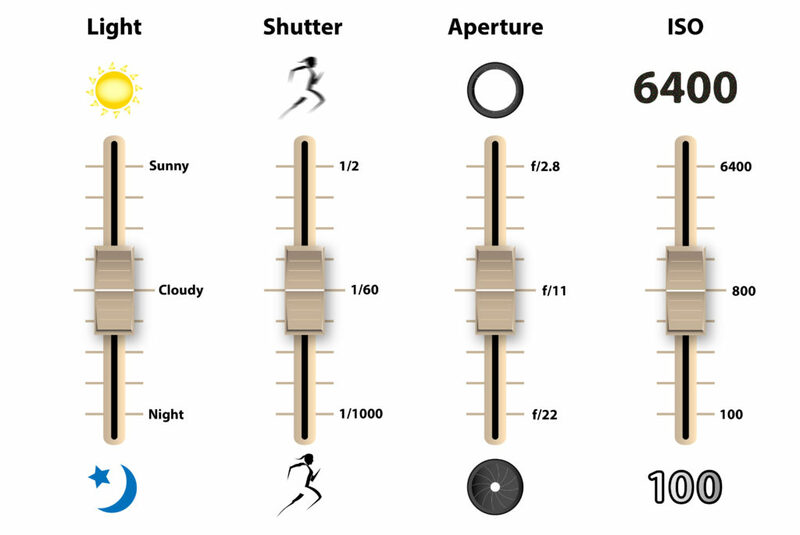 In Figure 11, the lights were turned down to 1/6 of the intensity to allow the same shutter and aperture settings that were used in Figure 10. Click on the images below for a larger view. Notice the consequence of using a higher ISO. The higher the ISO, the noisier the image. A high ISO can come in very handy at times, or even be essential, but be aware of the noise issue. It is generally advised to try and use the lowest ISO possible. As a final thought, if you are unsure about your photography, then use the auto mode. Many times, your camera’s automatic mode will work just fine. If you are more serious about photography, then you will probably want to take over at least some of the camera’s settings. That does not mean that you need to take over all settings for every image. Many times, I will allow the camera to set the ISO automatically if I am concerned about both the shutter speed and depth-of-field. It is also common for me to set the camera to aperture priority and let the camera choose the ISO and shutter speed. It helps to know exactly what parameters you need to take control of and what you can safely leave to the camera as this will speed up your process. With experience, this will become so second-nature that you won’t think about it anymore than you do about tying your shoes.